Today is indeed a good day for all AT&T subscribers. We´ve just got leaked info on four upcoming Nokia phones. While the provided specifications look feasible, the release dates might not be really correct, because the document seems a bit old. We will try to keep this simple – the Nokia Mako is a side-slider, which looks really interesting and quite futuristic. It has a four-row QWERTY and 2.4-inch QVGA resolution screen. It is a S60 3.2 smart phone and the most notable features are its 2MP camera, AGPS and dual-band HSDPA. The indicated release date is June 5; however, the source presumes that isn’t quite likely. 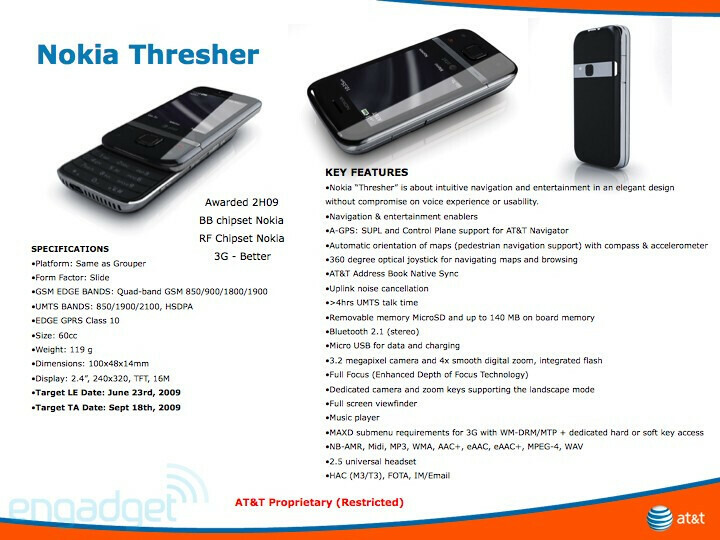 The second phone we will take a look at is the Nokia Thresher. It is a stylish slider, equipped with Series 40 interface, tri-band UMTS, AGPS, 3.2MP camera and optical joystick. 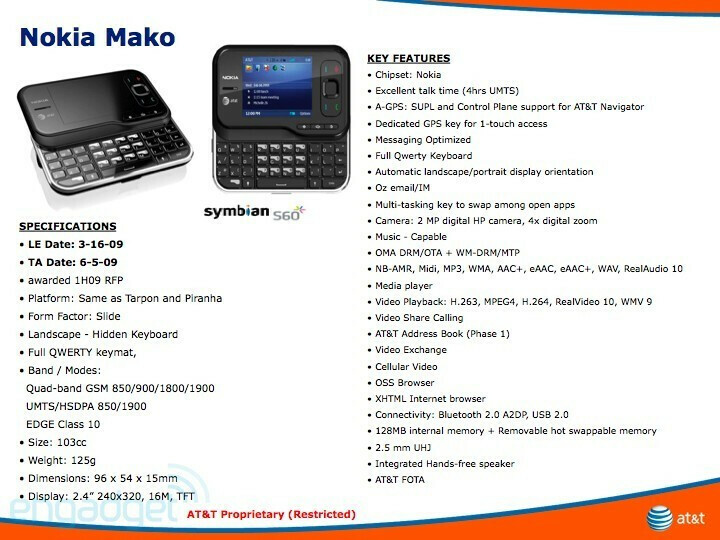 This trendy looking handset has a September 18 launch date on the same document. Next on the list are two clamshells. 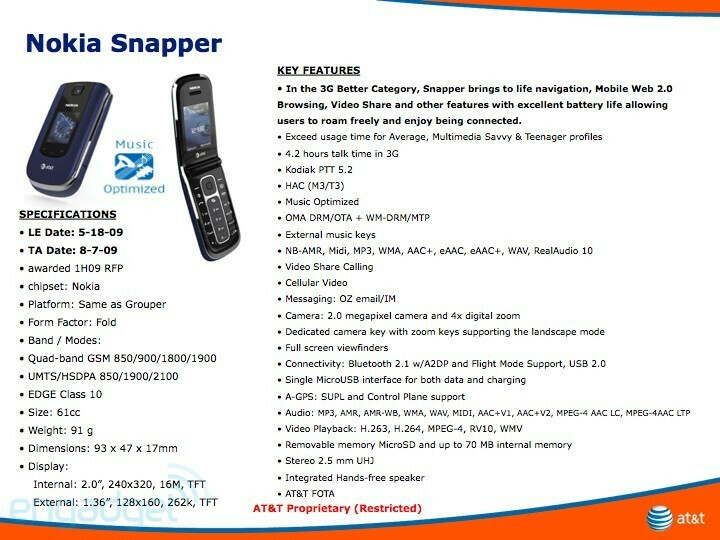 The first one is the Snapper, which looks too much old-school. Still, a tri-band UMTS support seems to be here along with 2MP camera, AGPS and music-dedicated keys. Look for this one sometime around August 7. 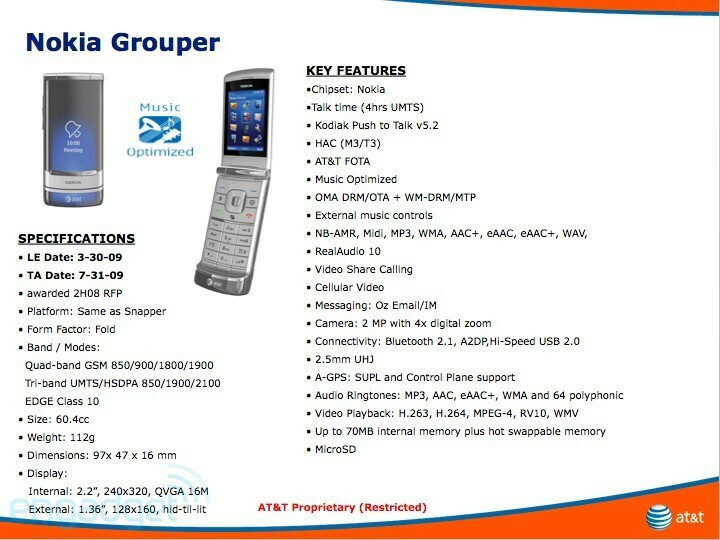 The Nokia Grouper is a good-looking piece of hardware, which had recently surfaced on FCC under the name Nokia 6750 Mural. The phone sports a stylish clamshell design and has tri-band 3G, 2MP camera, AGPS, music-dedicated keys and microSD slot. The Grouper will start spreading its beauty across the world July 31.
the screen looks a wee bit small. Looks like there are a lot of new phones coming this summer to ATT. For the most part they look pretty good, not to mention the New Iphone.